The extraordinary export saga of China General Nuclear to to build two of its Hualong One (HPR1000) PWR type reactors at the Bradwell site in Essex, UK met a major milestone on November 16, 2017. Britain’s Office for Nuclear Regulation said in a press statement that the reactor had completed stage one of the Generic Design Assessment which is a check of the readiness of the application to undergo a detailed safety review. 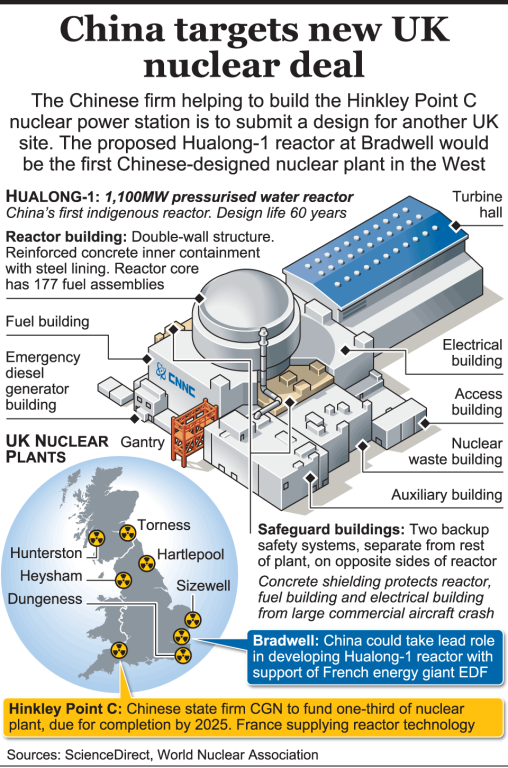 Britain’s Office for Nuclear Regulation said the Chinese HPR1000 reactor will now move to stage two of its generic design assessment – the formal process for approving a new reactor. The four-stage assessment process is expected to take around four years. Planning permission from the Department for Business, Energy and Industrial Strategy (BEIS). Mike Finnerty, the ONR’s deputy chief inspector and director of the ONR’s new reactors division, told wire services that the purpose of GDA is to determine whether the design meets the robust safety and security standards to make it suitable for use in the UK. CGN, which holds a one-third stake in the French-led Hinkley Point C EPR nuclear project, said it is confident that the HPR1000 will be approved by UK authorities for construction at Bradwell. The company hopes the GDA will be completed in less than five years. The costs of the GDA, which have not been disclosed, will be paid by French nuclear operator EDF and CGN, which have formed a joint venture called General Nuclear Systems Limited to develop the Bradwell plans. They are also behind plans for Hinkley Point C in Somerset and Sizewell C in Suffolk. EDF said the current reference plant for Bradwell B is CGN’s Fangchenggang Plant Unit 3 in China which started construction in February 2017 and is reported to be on schedule. The original reference design for the Hualong One is believed to be China’s Daya Bay reactor which is based on a French Framatone 900 MW unit. In the past other vendors, notably Westinghouse, have complained about the long duration and cost of the GDA. The ONR said in December 2016 that the firm was not meeting expectations in terms of what it needed to do to complete the GDA. The firm did turn things around and won approval in March 2017. Britain needs to fill an electricity supply gap in the next decade. Many of its nuclear plants are due to close by 2030 and the government plans to shut its coal plants by 2025 to help reduce carbon dioxide emissions. (South China Morning Post) According to a report in the Peoples Daily, which is state owned media, China is on course to develop nuclear-powered space shuttles by 2040, and will have the ability to mine resources from asteroids and build solar power plants in space. The ambitious claims were made by the China Academy of Launch Vehicle Technology – the country’s leading rocket developer and manufacturer. In 2025, it is expected to launch a reusable suborbital carrier and start suborbital space tourism. By 2030, it aims to put astronauts on the moon and have the capabilities to bring samples back from Mars. In the 2040s, a nuclear-powered fleet will be ready to carry out mining operations on asteroids and planets, the report said. However, a mainland space expert contacted by the SCMP said the targets given in the People’s Daily report would be almost impossible to achieve. “China does not even have a nuclear-powered aircraft carrier to sail the oceans,” the researcher, who requested not to be named, said. “Building a nuclear space fleet will remain on paper in the foreseeable future. We have not even solved some basic problems with conventional rocket technology yet,” he said. China’s current rocket fleet relies on chemical fuels. A Long March 5 heavy-lift rocket, designed for lunar missions and the construction of space stations, veered off course and crashed into the Pacific Ocean in July. The cause of the accident is still under investigation. (Economic Times) Ignoring the fact that French nuclear giant Areva S.A. is still recovering from a financial crisis, the Indian nuclear establishment continues to push for the Jaitapur Nuclear Power Project (JNPP) planned in Ratnagiri, Maharashtra. A fresh bid to hammer out a deal is expected when French President Emmanuel Macron visits India, most likely in December. The plant would build six 1600 MW EPRs two at a time. The Indian government may finally be interested in getting the project off dead center. It has been delayed for years by a combination of local land disputes, environmental reviews, and India’s nuclear supplier liability law which was pushed by the nation’s coal interests to throttle development of new nuclear reactors. Critics of the project point out that EPRs still under construction in Finland and France are significantly behind schedule and over budget. Neither unit is operational although the reactor in Finland is slated for start up testing in 2018. 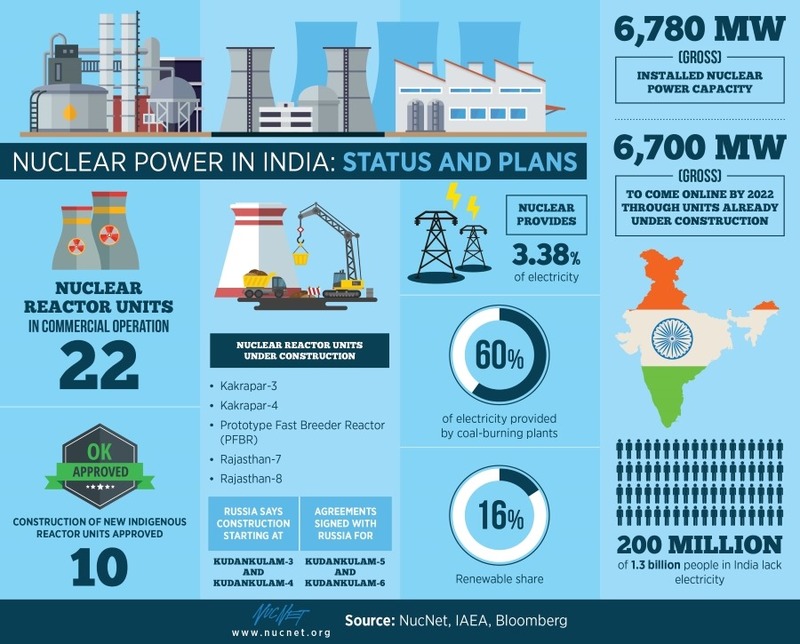 NucNet reports that India has struggled to attract the necessary investment and to gain access to reactor technology and expertise, with the Civil Liability Nuclear Damage Act of 2010 widely seen as deterring potential suppliers, especially Japanese and US companies. In further signs that the potential of commercial nuclear power is being taken seriously by India, minister of state for the prime minister’s office Jitendra Singh earlier this year told parliament that steps have been taken to fast-track nuclear projects and the construction of new plants in different parts of the country. He said the government has approved and financially sanctioned the construction of the 10 indigenous pressurized heavy water reactors (PHWRs) totaling around 7,000 MW. The PHWRs are scheduled to be progressively completed by 2031. The planned reactors are Kaiga-5 and -6 in Karnataka state, Chutka-1 and -2 in Madhya Pradesh, Mahi Banswara-1,-2,-3 and -4 in Rajasthan and Gorakhpur-3 and -4 in Haryana state, a facility officially known in India as the Gorakhpur Haryana Anu Vidyut Pariyojana nuclear station. The total cost of constructing the reactors is estimated at $16.3bn at a constant price level, which excludes inflation and interest during construction, Mr Singh said. Materials for the units would be sourced in India, he said. (NucNet): The lower capital costs of small modular reactors (SMRs) under 300 MWe may offer the US nuclear industry an attractive option to add new capacity with several entities are seeking to submit license applications for SMRs in the next several years, the US regulator said in its annual financial report for 2017. In a notice published in the Nov. 15 Federal Register, the Nuclear Regulatory Commission says it is not yet taking comment on the possible new rules, but will open a formal public comment period after a proposed rule is published. The NRC is releasing a “regulatory basis document” that lays out the case for new safety measures. “There is sufficient justification to proceed with rulemaking to develop a clear set of rules and guidance for [emergency preparedness] for SMRs and ONTs,” the commission said. The Nuclear Regulatory Commission also said in its financial report that it needs to be prepared for the challenge of licensing new SMR designs. It noted that the US Department of Energy is funding a program “to design, certify and help commercialize SMRs in the US. The NRC is developing a licensing framework for these as well as other advanced reactors. The NRC said market forces are putting pressure on nuclear operators to reduce operating costs. As a result, the the NRC needs to be prepared to address potential shutdowns of facilities before their licenses expire and to continue to ensure that oversight programs identify degrading facility safety and security performance. The NRC is funded by licensing fees for design reviews of new reactors, licensing actions for existing reactors, and other regulatory actions. The costs of these reviews can run in the hundreds of millions of dollars. For this reason the Department of Energy has been providing funding for firms like NuScale to support the design and licensing of small modular reactors (SMRs). (NucNet): Dominion Energy Virginia has notified the US Nuclear Regulatory Commission that it intends to apply for a second 20-year life extension for the twin-reactor North Anna nuclear power station in Virginia. The company said it would file a license renewal application with the NRC in 2020, following a similar application to extend the operating lifetime of two reactors at the Surry nuclear station, also in Virginia, to 80 years. Dominion said it expects to invest up to $4bn (€3.3bn) in upgrades to the two North Anna units and the two Surry units as part of the relicensing process. The Washington-based Nuclear Energy Institute said that of the 99 commercial nuclear power reactors operating in the US, 84 have had their original 40-year operating licences extended to 60 years. Three others that were issued licence renewals have since shut down. Another seven applications are under NRC review, and the remaining four are expected to apply between 2020 and 2022. By 2040, half of the nation’s nuclear plants will have been operating for 60 years. Under its second license renewal program, the industry is planning for a second round of license renewals to allow operation out to 80 years. (NucNet): US-based Lightbridge Corporation and Areva NP of France have signed three agreements to go ahead with development of Lightbridge’s metallic nuclear fuel technology while they finalize a planned joint venture. Lightbridge said in a press statement that the agreements are an integral part of the joint venture, which is expected to begin operations in the first quarter of 2018. The agreements govern joint research and development activities, and ownership of intellectual property. Lightbridge said its fuel technology is designed to significantly improve the economics and safety of existing and new nuclear power plants. The company said the agreements represent the first concrete step towards monetization of its intellectual property. A technical review of the new fuel was published in MIT Technology Review in March 2017. A summary of its performance characteristics included this description. In a press statement Areva said a joint venture (JV) will be the exclusive vehicle through which Lightbridge and AREVA NP will research, develop, demonstrate, fabricate, license, market and sell nuclear fuel assemblies that utilize Lightbridge’s proprietary metallic fuel designs and other advanced nuclear fuel intellectual property contributed by both Lightbridge and AREVA NP. Since 2011, Lightbridge says it has received valuable feedback on its fuel technology development through its Nuclear Utility Fuel Advisory Board, comprised of four leading U.S. nuclear utilities. Lightbridge also signed a letter of intent with a U.S. nuclear utility to demonstrate its fuel at a commercial nuclear power plant.